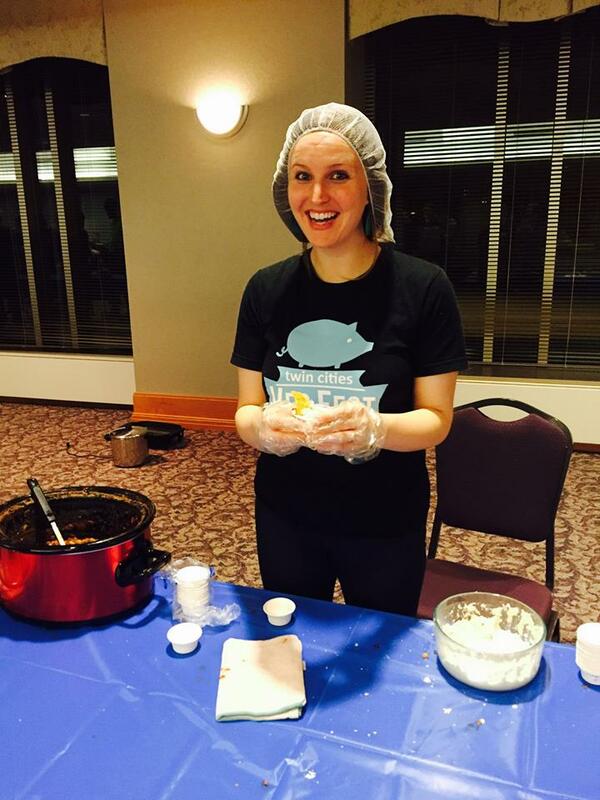 Julie ready to serve 200+ attendees at the 2017 Vegan Chili Cook-Off! Our 8th Annual Vegan Chili Cook-Off featured lots of delicious vegan chili. Here’s one of the winning recipes by Julie Knopp. The best thing about this chili is that it makes a lot and freezes well. It’s also inexpensive takes less than a half an hour of hands-on time in the kitchen. So easy! Heat the oil in a large saucepan over medium-high heat. Add the onion, zucchini, and celery and cook, stirring frequently, for about 5 minutes, until softened. Transfer the zucchini, onion, and celery to a slow cooker. Add the remaining ingredients and stir until well combined. Cook on low heat for about six hours, stirring occasionally. Serve with nondairy sour cream and corn chips. Put all ingredients in a food processor or high-speed blender and process until smooth, about 3 minutes.